Stuffed grape leaves are not only delicious but are fun to make. In my kitchen, my family stuffs and wraps the grape leaves together, even the children! It can be time-consuming for one person, but with many, the time goes by very quickly and you are on to eating this delectable appetizer. Remove grape leaves from jar and soak for a few hours in cold water. If not soaked properly, they will have a very salty taste. 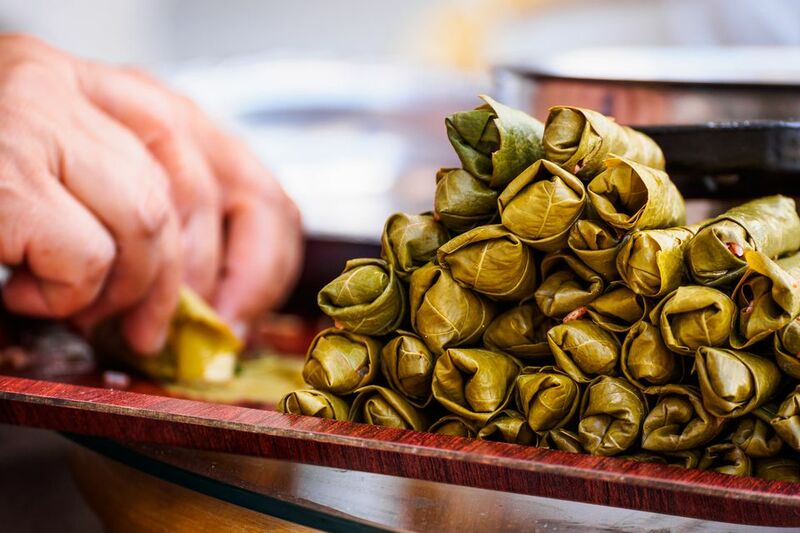 While grape leaves are soaking, mix together ground beef, tomato sauce, rice, parsley, coriander, salt, pepper and lemon juice. This is best done with your hands. Cover and place in refrigerator until ready to stuff leaves. Drain grape leaves and dry with paper towels. Remove stems. Place leaves shiny side down and have your meat mixture ready. Put about a teaspoon of mixture towards the bottom of the leaf. Fold in sides and roll upwards firmly. Do not roll too tightly. The rice does expand during cooking and may tear the leaf. Repeat with remaining leaves and mixture. In a large saucepan or dutch oven, place them side by side in circular layers. Place two lemon slices between the layers of grape leaves. Put a weight on top of the last layer of stuffed grape leaves -- a ceramic plate works well. This ensures that the leaves to do not move around during cooking. Fill the pot with water, covering the leaves. Simmer and cook for 30 minutes on low until the rice is done. When rice is tender, remove vine leaves from pot and serve.